First Appearance: Werewolf by Night (vol. 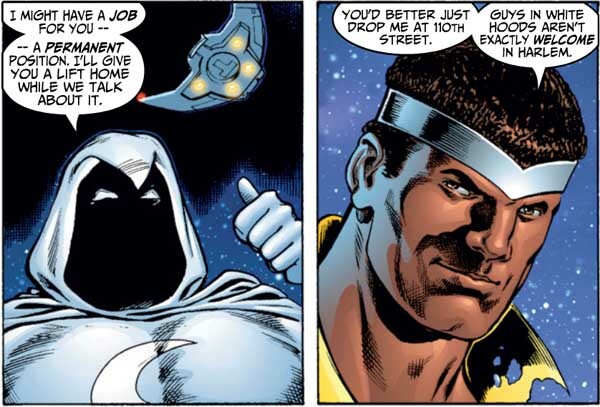 1) #32 (Aug. 1975): "The Stalker Called Moon Knight"
BELOW: Luke Cage makes a good-natured joke with Moon Knight about the Ku Klux Klan: The white costume and hood worn by the fellow super-hero Moon Knight apparently reminds race-conscious Luke Cage of the Ku Klux Klan. Cage makes a good-natured joke about the Klan with his future teammate. Cage tells him: "Guys in white hoods aren't exactly welcome in Harlem." Captain America (vol. 1) #245 (May 1980): "The Calypso Connection!" The Defenders (vol. 1) #47 (May 1977): "Night Moves!" The Defenders (vol. 1) #48 (June 1977): "Who Remembers Scorpio? Part One: Sinister Savior!" The Defenders (vol. 1) #49 (July 1977): "Who Remembers Scorpio? Part Two: Rampage"
The Defenders (vol. 1) #50 (Aug. 1977): "Who Remembers Scorpio? Part Three Scorpio: Must Die!" The Defenders (vol. 1) #51 (Sep. 1977): "A Round with the Ringer!" Hulk (vol. 3) #7 (Dec. 2008): "What Happens in Vegas"
Marvel Fanfare (vol. 1) #10 (Aug. 1983): "Brent Anderson Portfolio"
Marvel Fanfare (vol. 1) #25 (Mar. 1986): "Original Sim"
Marvel Knights (vol. 1) #5 (Nov. 2000): "Family and Friends"
Marvel Knights (vol. 1) #6 (Dec. 2000): "The Reckoning"
Marvel Knights (vol. 1) #7 (Jan. 2001): "Strange Matters"
Marvel Knights (vol. 1) #8 (Feb. 2001): "Dark Matters"
Marvel Knights (vol. 1) #9 (Mar. 2001): "Final Matters"
Marvel Knights (vol. 1) #11 (May 2001): "Hero for Hire"
Marvel Knights (vol. 1) #12 (June 2001): "The Long, Long Night"
Marvel Knights (vol. 1) #13 (July 2001): "No Rest for the Wicked"
Marvel Knights (vol. 1) #14 (Aug. 2001): "Everything Dies"
Marvel Team-Up (vol. 3) #10 (Sep. 2005): "Master of the Ring, Parts 5 and Conclusion"
Moon Knight (vol. 1) #27 (Jan. 1983): "There'll Be a Hot Time in the Old Bullpen Tonight"
The Punisher Annual #2 (Sep. 1989): "Knight Fight"
Werewolf by Night (vol. 1) #32 (Aug. 1975): "The Stalker Called Moon Knight"
Werewolf by Night (vol. 1) #33 (Sep. 1975): "Wolf-Beast Vs. 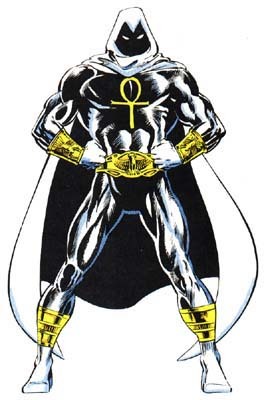 Moon Knight"
The West Coast Avengers (vol. 2) #26 (Nov. 1987): "What Is Scorpio"